Members of the Cyclone Energy team outside Iowa State University’s Family Resource Center. Pictured (left to right & bottom to top): Collin Blatchford, Devin Gaudette, Leo Brocka, Jordan Girolamo, JP Penton, Grace Mergens, Conor O’Brien, Beth Hartmann (adviser) and Jonathan Hoehne. Photo Courtesy Cyclone Energy. It’s springtime, and Cyclone Energy is ready! After winning last year’s ELECTRI International Green Energy Challenge (GEC), the team is working hard to get another win for the books. If they bring home first place this year, it would be the fifth consecutive win. One of the newer challenges they face is the rebuilding of the team itself. With a total of eight members this year – five new members and three returning members– there is a new team dynamic that must be found to achieve the five-peat. 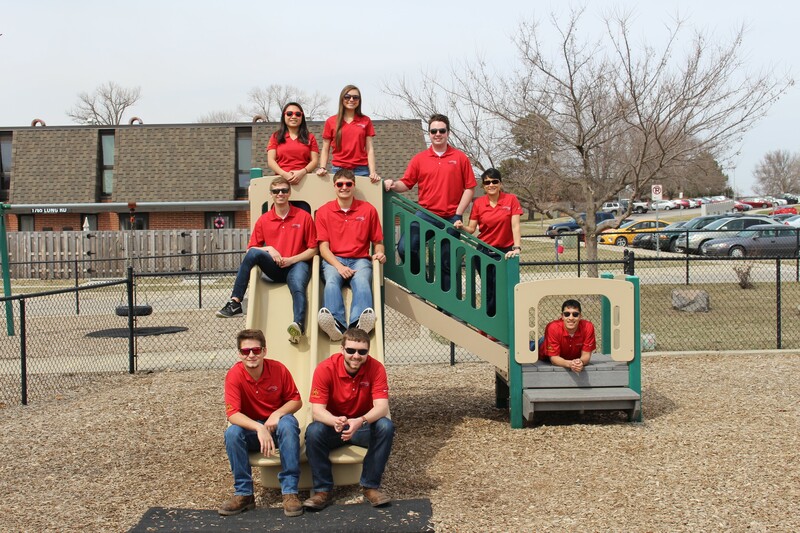 Cyclone Energy, which is sponsored by the Iowa National Electrical Contractors Association (NECA) Chapter, helps students develop an interest in the electrical construction industry, as well as improve communication and team building skills. This is the tenth year of the Green Energy Challenge. The Iowa State University team placed last in 2009. From that point on, the team has been getting better and better – from fifth place in 2011, to third place in 2012 and 2013, and to first place for four years in a row. Cyclone Energy chose the Family Resource Center/University Community Childcare Facility for this year’s challenge — to provide a design to help achieve a net-zero energy facility. The facility provides education and early care for infants, toddlers, pre-school and school-aged children for families of Iowa State faculty, staff and students. To achieve a net-zero energy facility, Cyclone Energy performed an energy audit, including an analysis of existing light fixtures in the building. After determining the energy demands of the building, the team designed a lighting retrofit and a photovoltaic system to meet the net-zero requirements. “This year’s net-zero requirement had the team think about the overall energy cost, along with the combination of different solutions to achieve it,” Collin Blatchford, a senior in construction engineering with an electrical emphasis, said. In addition to the proposal, Cyclone Energy has volunteered at the childcare facility by building shelves for the safety of the staff, fixing toys, mulching, and planting flowers. They have also donated time and money to the Boys & Girls Club of Story County by providing meals and activities to inform the kids about the electrical field. They are also planning Hotel LEGO® with the Boys and Girls Club of Story County. Hotel LEGO® is a session held by ISU construction engineering students to get elementary kids interested in STEM (specifically construction engineering). The students who run the session give a brief overview of construction engineering and the program at Iowa State. Then the kids are challenged to build a “hotel” out of LEGO® blocks following drawings that the students provide. Lastly, they have also donated time to other organizations, which include Project Linus and Science Day judging. They are excited to keep up with the volunteering opportunities and compete for a possible five-peat! Learn more about exciting student organizations at ISU CCEE by following us on Facebook, Twitter, and LinkedIn (Iowa State University Civil, Construction and Environmental Engineering and ISUConE).